Below is a list of some of the services available to clients. We try to focus on each client individually and only offer services you need for your specific business. Our goal is to offer your business superior support and services, but also to offer your business solutions before you encounter a problem. We work with medium business to offer technologies often only available to large corporations for manageable costs. We strive to not just be available when you have a problem, but to introduce technologies that can help your business. We feel that our System experience combined with our additional services set us apart from the others. 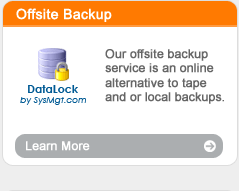 Our offsite backup service is an online alternative to tape and or local backups. This service is a secure solution managed, hosted and owned by System Engineering and Management. Your data is backed up via a secure web connection to a fully redundant RAID network attached storage device and is also replicated to a second drive array for redundancy. Our backup system allows for backup of all files and folders, Exchange (including Exchange 2007), SQL Server, Oracle, locked files as well as many other file standards and programs. Your information is stored encrypted and only accessible to your business. In the event you have a failure, your data is safe and you can return to business as usual with minimal downtime. Many businesses do not monitor their network systems for outages causing unexpected server downtime and lost revenue. SysMgt.com has a solution that allows your essential personnel to be notified immediately in the event of a failure. Our remote monitoring system only requires a "local agent" on your network to test all your resources, whether they are Domain Servers, Exchange servers, print servers, network file and folders, firewalls and any other essential resource. In the event of an outage you have the option to be notified via email, text message or both for instantaneous information. 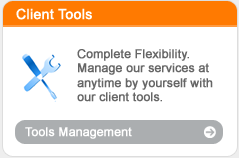 You can also select for SysMgt.com to be notified so we can be prepared for your needs. A web interface allows you to check your resources from anywhere with internet access. Don't let your customers or employees be the ones to call you... use our services to fix the problem and minimize lost revenue and productivity. We offer hosted solutions for your email needs using the latest technology. Your hosted Exchange email account is stored and managed solely by System Engineering and Management using enterprise level servers for ensured uptime and availability. Your email is available through internal Microsoft Outlook software or via the Outlook Web Access tool. All email is scanned my Trend Micro for virus security and our SPAM system is Enterprise grade to give you the peace of mind that you receive all your emails, but not all the SPAM. For those small businesses with only one email server, we offer a secondary SMTP gateway to ensure you receive all your mail in the event of an outage. You don't want your customers emails getting lost and we are here to help ensure that they arrive once your email server is up and running. Copyright © 2019 System Engineering and Management. All Rights Reserved.